Objectives To examine whether during a period of limited e-cigarette regulation and rapid growth in their use, smoking began to become renormalised among young people. Design Interrupted time-series analysis of repeated cross-sectional time-series data. Participants 248 324 young people aged approximately 13 and 15 years, from three national surveys during the years 1998–2015. Intervention Unregulated growth of e-cigarette use (following the year 2010, until 2015). Outcome measures Primary outcomes were prevalence of self-reported ever smoking and regular smoking. Secondary outcomes were attitudes towards smoking. Tertiary outcomes were ever use of cannabis and alcohol. Results In final models, no significant change was detected in the pre-existing trend for ever smoking (OR 1.01, CI 0.99 to 1.03). There was a marginally significant slowing in the rate of decline for regular smoking (OR 1.04, CI 1.00 to 1.08), accompanied by a larger slowing in the rate of decline of cannabis use (OR 1.21, CI 1.18 to 1.25) and alcohol use (OR 1.17, CI 1.14 to 1.19). In all models and subgroup analyses for smoking attitudes, an increased rate of decline was observed after 2010 (OR 0.88, CI 0.86 to 0.90). Models were robust to sensitivity analyses. Conclusions There was a marginal slowing in the decline in regular smoking during the period following 2010, when e-cigarettes were emerging but relatively unregulated. However, these patterns were not unique to tobacco use and the decline in the acceptability of smoking behaviour among youth accelerated during this time. These analyses provide little evidence that renormalisation of youth smoking was occurring during a period of rapid growth and limited regulation of e-cigarettes from 2011 to 2015. Growth of e-cigarette use among young people has been framed to some extent as a potential public health problem in its own right, due to some evidence from animal models that nicotine may impair adolescent brain development.12 However, the most commonly expressed concern among those calling for greater regulation relates to their potential impact on young people’s smoking. Unlike adult use of e-cigarettes which has largely been limited to smokers or ex-smokers,13 emerging international evidence indicates increasing numbers of adolescents who have never used tobacco are experimenting with e-cigarettes.14–16 These studies show that by 2015, experimentation with e-cigarettes was more common than experimentation with tobacco. Notably, they also show that experimentation is not translating into widespread regular e-cigarette use to date.17 18 Nevertheless, a perception that e-cigarette proliferation may renormalise smoking,19 through leading young people to view smoking as a socially acceptable behaviour, has been cited in policy documents in several countries as a rationale to support more restrictive policies. The European Union (EU) Tobacco Products Directive (TPD)20 has regulated e-cigarettes in partial alignment with tobacco, contending “Electronic cigarettes can develop into a gateway to nicotine addiction and ultimately traditional tobacco consumption, as they mimic and normalise the action of smoking. For this reason, it is appropriate to adopt a restrictive approach to advertising electronic cigarettes and refill containers” (page 720). The Australian government has stated: “…the Department is concerned about evidence suggesting that e-cigarettes may provide a gateway to nicotine addiction or tobacco use (particularly among youth), and may re-normalise smoking” (page 121). Much success in maintaining a continuous downward trajectory in youth smoking in the past 20 years has been achieved through policies that aim to reverse the normalisation of smoking.22 The renormalisation hypothesis23 assumes that growing prevalence and visibility of e-cigarette use will reverse tobacco control successes through increasing the extent to which smoking is once again seen as a ‘normal’ behaviour, accepted and accommodated by the non-smoking majority, including young people. However, the hypothesis that e-cigarettes will renormalise smoking in young people is premised on an assumption that tobacco use and e-cigarette use are viewed by young people as sufficiently similar for one to renormalise the other. By contrast, some argue that e-cigarettes may denormalise smoking,24 through social display of an alternative behaviour, leading to displacement away from tobacco use for some young people who would otherwise have become smokers. From this perspective, alignment of e-cigarettes with tobacco in terms of regulatory frameworks paradoxically risks creating a perception that they are synonymous, potentially creating conditions for renormalisation to occur. To date, national surveys in a number of countries have shown that smoking rates among young people have continued to fall in recent years, despite the growth of e-cigarette use.17 25–28 However, few attempts have been made to model whether this decline has occurred at a faster rate (as would be expected were displacement to be taking place), or a slowed rate since the emergence of e-cigarettes (as would be expected were renormalisation to be taking place), or to examine changes in young people’s attitudes toward smoking as a normative behaviour. To date, only one US study has tested these changes in trend, finding no evidence of change in trend for youth smoking during the period of rapid growth, but limited regulation, of e-cigarette use.29 The aim of the current study was therefore to examine these competing hypotheses by examining trends of smoking and smoking attitudes of young people in the UK since 1998, with a focus on whether these trends changed significantly after 2010 until 2015—the period of time when e-cigarettes were emerging, but largely unregulated (ie, before the introduction of the EU TPD).20 Changes in trend for tobacco use and smoking attitudes were accompanied by analyses of trends for alcohol and cannabis use, to examine the extent to which change in trend during this period is unique to tobacco or reflective of broader substance use trajectories which are less likely to have changed as a direct consequence of e-cigarettes. All surveys asked young people to indicate whether they were male or female. SALSUS only surveys pupils in S2 and S4 (ie, pupils aged approximately 13 and 15 years, respectively). SDDU and HBSC/SHRN datasets collect data from 11 to 16 year olds, but for comparability with Scotland were limited to approximately equivalent school year groups (ie, years 9 and 11). As not all surveys provide an age variable, year group was used as a proxy for age. In SALSUS and SDDU, socioeconomic status (SES) was indicated by a binary variable representing whether or not students reported receiving free school meals. In HBSC/SHRN, the Family Affluence Scale (FAS),49 which measures material affluence, was used to indicate SES. As material markers of deprivation shift substantially over time, a relative measure of SES was derived whereby the sample was divided into ‘high’ and ‘low’ affluence within the survey year in question. Two binary variables were derived to indicate whether students had ever smoked and whether they smoked regularly (ie, weekly or more). In SDDU and SALSUS, participants were asked to indicate which of the following statements best described them: ‘I have never smoked’, ‘I have only ever smoked once’, ‘I used to smoke but I never smoke a cigarette now’, ‘I sometimes smoke a cigarette now, but I don’t smoke as many as one a week’, ‘I usually smoke between one and six cigarettes a week’, ‘I usually smoke more than six cigarettes a week’. To indicate ever smoking, those who reported ‘I have never smoked’ were compared with all others. For regular use, those who reported smoking between one and six cigarettes a week, or more, were compared with all others. In HBSC/SHRN, students were asked at what age they ‘smoked a cigarette (more than just a puff)’ with the following response options: ‘never’ or a range of ages. Those who reported ‘never’ were compared with all others. Students in HBSC/SHRN were also asked, ‘how often do you smoke at present?’ with response options: ‘every day’, ‘at least once a week but not every day’, ‘less than once a week’ or ‘I do not smoke’. To indicate regular use, those who reported use at least once a week or more frequently were compared with all others. In SALSUS (from 2006) and SDDU (from 2003), students were asked ‘Do you think it is OK for someone your age to do the following? : Try a cigarette to see what it is like’. In SDDU in 1999 and 2001, the question wording was slightly different (‘Try smoking once’). Hence, analyses were run with and without these earlier years as a sensitivity analysis. In SDDU only (from 2003), students were also asked whether it was OK for someone their age to smoke cigarettes once a week. Response options for both items were: ‘it’s OK’, ‘it’s not OK’ and ‘I don’t know’. For each smoking attitudes measure, two dichotomous variables were created which coded ‘I don’t know’ as ‘yes’ as well as ‘no’, respectively. Falsifiability checks included replicating analyses for binary indicators of ever alcohol use and ever cannabis use. For alcohol use, both SALSUS and SDDU asked students ‘Have you ever had a proper alcoholic drink – a whole drink, not just a sip?’ with responses of ‘yes’ or ‘no’. From 2002, HBSC/SHRN surveys asked students ‘At what age did you do the following things? If there is something that you have not done, choose the ‘never’ category.’ Responses other than ‘never’ for the category ‘drink alcohol (more than a small amount)’ were classed as ever drinkers. To measure ever cannabis use in SALSUS and SDDU, students were presented with a grid listing a range of drugs and asked which, if any, they have ever used with response options ‘yes’ or ‘no’. In HBSC, pupils were asked how many times they have used cannabis in their lifetime with response options of ‘never’, ‘once to twice’, ‘3 to 5 times’, ‘6 to 9 times’, ‘10 to 19 times’, ‘20 to 39 times’ and ‘40+ times’. A binary variable distinguished ever users from never users. where πki was the expected value of Yki ; time was a continuous variable indicating time from the start of the study to the end of the period of observation; intervention was coded 0 for pre-intervention time points (before, and including, year 2010) and 1 for post-intervention time points (from 2011); and postslope was coded 0 up to the last point before the intervention phase and coded sequentially from 1, 2… thereafter. β0 estimated the baseline level of the outcome at time 0 (beginning of the period); β1 estimated the structural trend, independently from the policy intervention; β2 estimated the immediate impact of the intervention and β3 reflects the change in trend/slope after the intervention; β4 is the set of parameters corresponding to the country dummy variables. Data were analysed with all countries’ data combined with year group and gender included as covariates. A time2 covariate was also included to allow for non-linear trajectories in a separate quadratic model. Models were repeated for all outcomes. Females (as opposed to males), older adolescents and less affluent groups have typically reported higher prevalence rates of smoking, and the role of e-cigarettes in exacerbating or reducing these inequalities is of significant interest. For subgroup analyses, models were therefore stratified by gender, year group, and (where available) SES. Interaction effects by year group and gender were also investigated. In pre-specified sensitivity analyses, models were also run: with England data only (the country with largest number of data points); with data points excluded for when a survey was conducted at a different time of year (eg, SALSUS 2002 and 2006); and with survey weights applied. The extent of non-response was deemed to be sufficiently trivial for the analysis to be conducted on a complete-case basis, with data unavailable on the primary outcomes of ever and regular smoking for only 1.9% and 1.8% of pupils within the final dataset, respectively. While models were a priori assumed linear, examination of trends over time pointed towards non-linearity for some outcomes. Entry of a quadratic term to the model which allowed for structural departures from linearity changed the size and direction of odds ratios in models, revealing sensitivity to these assumptions. Quadratic models are therefore reported alongside linear models and are referred to from here on as the final models. As most trends were clearly linear from the turn of the millennium, a further post-hoc sensitivity analysis involved exclusion of the earliest time points and modelling of ‘pre-intervention’ trend from 2001 to 2010 only. All analyses were run using STATA/SE 14.2. For primary and tertiary outcomes, data from at least one UK country were available for each of 18 time points, representing 248 324 survey respondents. For smoking attitudes, at least 15 time points were available representing 162 324 survey respondents. Across all outcomes, prevalence rates decreased over the study period (see online supplementary material tables 1-14). From 1998 to 2015, among children aged 13 and 15, the percentage of ever smokers decreased from 60% (n=3 792) to 19% (n=6 852) while regular smokers decreased from 19% (n=1 209) to 5% (n=1 618; note 2015 did not include data from England; see online supplementary tables 1 and 3, respectively). Perceptions of smoking also changed over time: the percentage of participants who reported that trying a cigarette was ‘OK’ declined from 70% (n=2 407) in 1999 to 27% (n=6 412) in 2015 (see online supplementary table 5). The percentage of young people in England reporting that it was ‘OK’ to smoke weekly declined from 36% (n=1 434) in 2003 to 14% (n=334) in 2014 (where including those who responded ‘I don’t know’ as ‘not OK’, see online supplementary table 9). With ‘I don’t know’ responses coded as ‘OK’, the percentage of participants who reported that trying a cigarette was ‘OK’ declined from 79% (n=2 859) in 1999 to 42% (n=9 904) in 2015 (see online supplementary table 7) and the percentage of participants in England who reported it was ‘OK’ to smoke weekly declined from 47% (n=1 876) in 2003 to 23% (n=554) in 2014 (see online supplementary table 10; from here on, analyses are reported with ‘I don’t know’ coded as ‘not OK’, and sensitivity analyses where ‘I don’t know’ was coded as ‘OK’ can be found in online supplementary material tables 7–8, 1 and 18). Between 1998 and 2015, ever cannabis use decreased from 29% (n=1 415) to 9% (n=3 052) and ever alcohol use from 79% (n= 2904) to 48% (n=16 866; see online supplementary materials tables 11–14). Table 1 shows model results, adjusted for covariates, for ever smoked and regular smoking (for the whole sample and subgroups based on gender and year group). Table 2 shows model results, adjusted for covariates, for smoking attitudes (for the whole sample and subgroups based on gender and year group, see online supplementary tables 15 and 16 in supplementary material for subgroup analyses by SES and for England only). As indicated by the final quadratic models in table 1, for the whole sample, change in the rate of decline for ever smoking post-2010 was not significant, though a marginally significant (p=0.03) slowing in the rate of decline occurred for regular smoking. 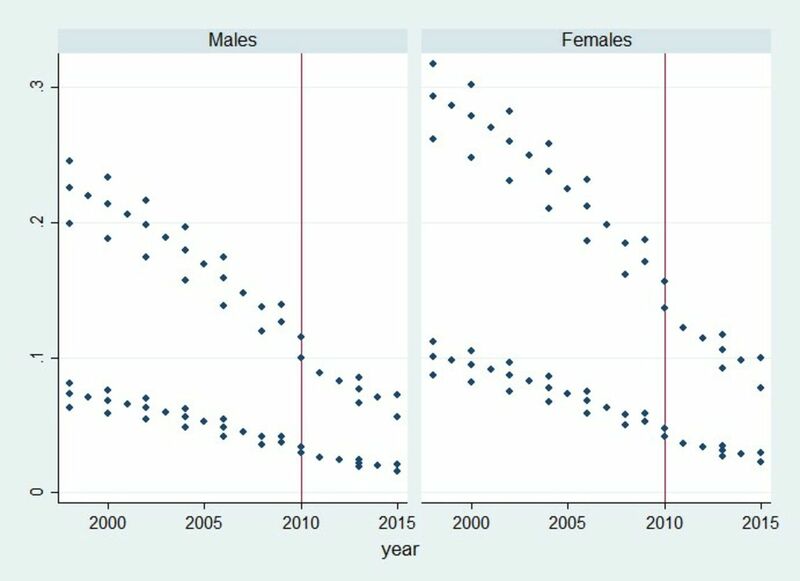 For subgroup analyses, the slowing decline in regular smoking post-2010 was limited to groups for whom rates had declined rapidly before 2010 (ie, females and 13 year olds, see figure 1). 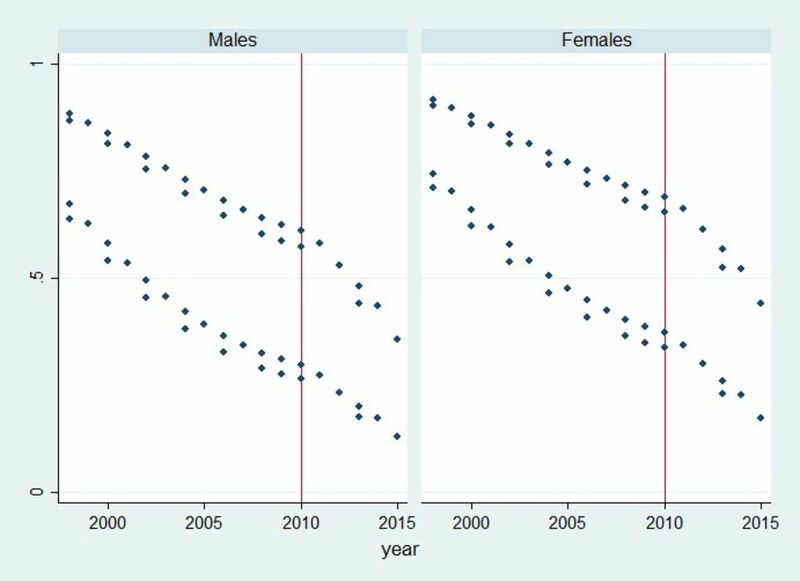 Similarly, there was a significant slowing in the rate of decline post-2010 among these subgroups for ever smoked, though a significant increase in the rate of decline for 15 year olds (see online figure 1 supplementary material). For smoking attitudes, there was consistent evidence across all subgroups of an increased rate of decline in the percentage of young people saying that trying smoking is ‘OK’ and weekly smoking is ‘OK’, except for subgroup analyses of attitudes of smoking weekly for females (see figure 2 and table 2). Predicted probabilities of regular smoking for males and females in England, Scotland and Wales, from logistic regression analyses (the top lines represent 15 year olds, the bottom 13 year olds). Predicted probabilities of stating that trying smoking is ‘OK’ for males and females in England and Scotland, from binary logistic regression analyses (the top lines represent 15 year olds, the bottom 13 year olds). For ever and regular smoking, there was a significant reduction in prevalence at the intervention point (referred to as ‘level’ in the table, and from here on) for the whole sample and all subgroups. Changes in trend were robust to pre-specified sensitivity analyses, although some England-only models differed slightly from the whole group models (see online supplementary tables 15 and 16). In post-hoc sensitivity analyses modelling trends from 2001 to account for non-linearity (not shown in tables), the statistical evidence for a change in trend for regular smoking weakened (OR 0.99, CI 0.94 to 1.03), and magnitude for change in trend lowered for ever cannabis use (OR 1.05, CI 1.01 to 1.09) and alcohol use (OR 1.05, CI 1.02 to 1.08) though remaining significant, although other findings were not materially altered. For sensitivity analyses of smoking attitudes (trying smoking is ‘OK’) not including years 1999 and 2001, no differences in results were found for change in decline (OR 0.85, CI 0.81 to 0.88; p<0.001), although the level became significant (OR 1.08, CI 1.01 to 1.16; p=0.030). Inclusion of time*gender interaction terms showed that for all outcomes (with the exception of alcohol use) changes in the secular decline over time was significantly greater for females than for males (see online supplementary table 20). For gender, there was no significant effect modification for level or post-slope terms, except for attitudes towards smoking weekly where the rate of decline increased at a significantly faster rate for males than for females (though with a significant increase in trend for males). Inclusion of time*year group interaction terms showed that for all outcomes (with the exception of attitudes towards smoking weekly), the changes in the secular decline over time was greater for 13 year olds than for 15 year olds. Change in level post-2010 was more negative among 13 year olds for ever smoked and ever alcohol use. For post-slope terms, declines in prevalence for ever smoked, regular smoking and positive attitudes towards trying smoking were greater for 15 year olds than 13 year olds. Decreases in rates of decline post-2010 were observed for alcohol use and cannabis and in greater magnitude than change in regular smoking (OR 1.17, CI 1.14 to 1.19, and OR 1.21, CI 1.18 to 1.25, respectively; see table 3). These were generally consistent across all subgroups (see online supplementary table 19 as well as figures 5-6 in supplementary material). This study benefits from the use of a large, nationally representative sample of school-age children from England, Scotland and Wales, covering a long time period (17 years). It also benefited from investigating smoking attitudes, contributing to understanding underlying theoretical mechanisms of renormalisation hypothesis, and locating changes in smoking within the context of wider youth substance use trajectories to assess whether or not findings were unique to smoking outcomes. Nevertheless, it does suffer some substantial limitations. Survey intervals and the methods used varied. While all surveys used two-stage cluster sampling, recruiting schools and then pupils, the absence of school identifiers within some datasets precluded adjustment for clustering. Smoking typically exhibits a moderate to high degree of intra-cluster correlation.52 Hence, adjusting for clustering would likely have led to a change in trends, such as that for smoking regularly where significance was borderline (p=0.03), becoming non-significant. It would likely have had less of an impact on results for smoking attitudes, which had p values typically below 0.001. Robust country-specific analyses were only possible for England as this country provided the most frequently occurring data points before and after the intervention time point. Stratification by SES based on free school meal entitlement was only possible for England and Scotland data, as survey data from Wales did not contain an equivalent indicator of SES, and findings from these subgroups are presented with caution. Events other than the increased use of e-cigarettes might have contributed to the increased decline in positive smoking attitudes observed in the current study, and causality cannot be asserted. The fact that estimates are available only on an annual or biennial basis limits our ability to understand covariance between e-cigarettes and tobacco use over time. Nevertheless, the study has important implications. It demonstrates the success of public health efforts in reducing smoking among young people. With the average prevalence levels of ever smokers having decreased by nearly 40 percentage points for adolescents within two decades, it is no surprise many fear a reversal in this progress. However, given the limited evidence for the renormalisation of youth smoking, it is perhaps unhelpful for policy on e-cigarette regulation to be justified on the sole basis that they renormalise smoking.20 Some evidence from animal models suggests that nicotine use during adolescence can inhibit brain development. Because of this, use of e-cigarettes among young people has been described as a potential concern in its own right. While evidence to date suggests that regular use among non-smokers is rare,17 continued conflation with the normalisation of tobacco may be an unhelpful distraction from the need to consider whether youth e-cigarette use does become a potential problem in isolation from its links to tobacco. Understanding young people’s perceptions of e-cigarettes, the ways in which they are viewed as similar or different to cigarettes, and how these vary according to regulatory frameworks, is an important direction for future research. It remains to be seen whether trajectories of e-cigarette use, smoking and smoking attitudes will change (positively or negatively) as a result of increased e-cigarette regulations such as the marketing restrictions and product labelling brought in by the EU TPD. Within the UK, while regulatory frameworks have to date been similar, Welsh and Scottish governments53 have pursued (but not yet implemented) more restrictive regulatory frameworks than England.54 Wales was the only country whose government attempted (unsuccessfully) to ban vaping in public places, while Scotland is considering further restrictions on marketing of e-cigarettes. Future research focusing on how divergences in policy impact young people’s use of and attitudes toward tobacco, and e-cigarettes, would further enhance our understandings of these issues. While this policy landscape is shifting, so are the products themselves. E-cigarettes have been described as mimicking behavioural aspects of smoking; as discussed, the renormalisation hypothesis is premised on the assumption that cigarettes and e-cigarettes are viewed as similar to each other.23 However, e-cigarettes have changed substantially over time and now resemble traditional cigarettes less than early ‘cig-a-like’ models, which may decrease perceived similarity. Saebo and Scheffels23 state that the normalisation of e-cigarettes can occur during the simultaneous continued de-normalisation of cigarette use, and this appears to be reflected in the findings reported here. However, newer products entering the market have been described by some as showing particular popularity among young people in the USA.55 Hence, while neither widespread regular youth vaping, nor the renormalisation of smoking, appear to have occurred during the period investigated here, ongoing monitoring of young people’s e-cigarette use, and links to smoking, remains a public health priority. E-cigarette experimentation is increasing among young people who have not previously used tobacco, leading to fears that e-cigarettes may renormalise smoking. However, e-cigarette experimentation is not translating into regular e-cigarette use, and smoking rates among young people continue to fall. It has not been tested whether the proliferation of e-cigarettes has renormalised, or displaced, smoking behaviour and smoking attitudes among young people. While the rate of decline for regular smoking did marginally slow between 2011–2015, this was also found for cannabis and alcohol use. Furthermore, the decline in the perceived acceptability of smoking behaviour accelerated during this period. Our findings do not support the hypothesis that e-cigarettes renormalised youth smoking during a period of growing but largely unregulated use in the UK. The authors would like to thank Chris Roberts for supplying the HBSC data for Wales.
. Trends in electronic cigarette use in England. Smoking Toolkit Study. UK: University College London, 2018.
. Statement from specialists in nicotine science and public health policy. 2014.
. Evidence review of e-cigarettes and heated tobacco products 2018. A report commissioned by Public Health England. London: Public Health England, 2018.
. E-cigarettes and the law in Australia. Aust Fam Physician 2015;44:415. Parliament of the Commonwealth of Australia. Report on the inquiry into the use and marketing of electronic cigarettes and personal vaporisers in Australia. Canberra: House of Representatives Standing Committee on Health, Aged Care and Sport, 2018. US Department of Health and Human Services. E-cigarette use among youth and young adults: a report of the Surgeon General. Atlanta, GA: US Department of Health and Human Services, Centers for Disease Control and Prevention, National Center for Chronic Disease Prevention and Health Promotion, Office on Smoking and Health, 2016. Official Journal of the European Union. The Tobacco Products Directive: Official Journal of the European Union, 2014. Australian Government. Standing Committee on Health, Aged Care and Sport - Inquiry into the Use and Marketing of Electronic Cigarettes and Personal Vaporisers in Australia In: Care DoHaS. 2017.
. E-cigarettes: an evidence update. London: Public Health England, 2015. Centre for Disease Control and Prevention Newsroom. E-cigarette use triples among middle and high school students in just one year. 2015 https://www.cdc.gov/media/releases/2015/p0416-E-cigarette-use.html. National Centre for Social Research, National Foundation for Educational Research. Smoking, Drinking and Drug Use among Young People, 2000. [data collection]. UK Data Service. 2002 http://doi.org/ (Accessed 01 Jun 2018). National Centre for Social Research, National Foundation for Educational Research. Smoking, drinking and drug use among young people, 2001. [data collection]. UK Data Service. 2003 http://doi.org/ (Accessed 01 Jun 2018). National Centre for Social Research, National Foundation for Educational Research. Smoking, Drinking and Drug Use among Young People, 2002. 2nd edn: UK Data Service, 2004. National Centre for Social Research, National Foundation for Educational Research. Smoking, Drinking and Drug Use among Young People, 2003. [data collection]. : UK Data Service. 2005 http://doi.org/ (Accessed 01 Jun 2018). National Centre for Social Research, National Foundation for Educational Research. Smoking, Drinking and Drug Use among Young People, 2004. [data collection]. UK Data Service. 2005 http://doi.org/ (Accessed 01 Jun 2018). National Centre for Social Research, National Foundation for Educational Research. Smoking, Drinking and Drug Use among Young People, 2005. [data collection]. UK Data Service. 2007 http://doi.org/ (Accessed 01 Jun 2018). National Centre for Social Research, National Foundation for Educational Research. Smoking, Drinking and Drug Use among Young People, 2006. [data collection]. 2008 http://doi.org/ (Accessed 01 Jun 2018). National Centre for Social Research, National Foundation for Educational Research. Smoking, Drinking and Drug Use among Young People, 2007. [data collection]. UK Data Service. 2008 http://doi.org/ (Accessed 01 Jun 2018). National Centre for Social Research, National Foundation for Educational Research. Smoking, Drinking and Drug Use among Young People, 2008. [data collection]. UK Data Service. 2009 http://doi.org/ (Accessed 01 Jun 2018). National Centre for Social Research, National Foundation for Educational Research. Smoking, Drinking and Drug Use among Young People, 2009. [data collection]. UK Data Service. 2010 http://doi.org/ (Accessed 01 Jun 2018). National Centre for Social Research, National Foundation for Educational Research. Smoking, Drinking and Drug Use among Young People, 2010. [data collection]. UK Data Service. 2011 http://doi.org/ (Accessed 01 Jun 2018). National Centre for Social Research, National Foundation for Educational Research. Smoking, Drinking and Drug Use among Young People, 2011. [data collection]. : UK Data Service. 2012 http://doi.org/ (Accessed 01 Jun 2018). National Centre for Social Research, National Foundation for Educational Research. Smoking, Drinking and Drug Use among Young People, 2012. [data collection]. UK Data Service. 2013 http://doi.org/ (Accessed 01 Jun 2018). National Centre for Social Research UK Data Service. Smoking, drinking and drug use among young people, 2013. [data collection]. 2015 http://doi.org/ (Accessed 01 Jun 2018). NatCen Social Research. Smoking, Drinking and Drug Use among Young People, 2014. [data collection]. UK Data Service. 2015 http://doi.org/. Office for National Statistics. Social Survey Division. Smoking, drinking and drug use among young teenagers, 1998. [data collection]. UK Data Service. 2000 http://doi.org/ (Accessed 01 Jun 2018). Office for National Statistics. Social Survey Division. Smoking, drinking and drug use among young teenagers, 1999. [data collection]. UK Data Service. 2001 http://doi.org/ (Accessed 01 Jun 2018). Ipsos MORI Scotland. Scottish schools adolescent lifestyle and substance use survey trend data, 1990-2013. [data collection]. UK Data Service. 2015 http://doi.org/ (Accessed 01 Jun 2018). Ipsos MORI Scotland. Scottish schools adolescent lifestyle and substance use survey, 2015. [data collection]. UK Data Service. 2017 http://doi.org/ (Accessed 01 Jun 2018).
. Health Survey for England 2015 Children’s smoking and exposure to other people’s smoke. 2016. Department of Health and Social Care. Towards a smoke-free generation: a tobacco control plan for England. London: Department of Health, 2017. Contributors GM conceived the study. EL, BH, and GM compiled the dataset. BH and GM analysed the data with senior statistical guidance and oversight from LG. BH wrote the first draft of the manuscript with OM and GM. BH revised the drafts. All authors contributed to data interpretation, critical revisions, and final approval of the manuscript. BH is the guarantor. Funding This work presents independent research funded by the National Institute for Health Research (NIHR) in England under its Public Health Research Board (grant number 16/57/01). The views expressed in this article are those of the authors and do not necessarily reflect those of the National Health Service (NHS), the NIHR or the Department of Health for England. The work was also undertaken with the support of The Centre for the Development and Evaluation of Complex Interventions for Public Health Improvement (DECIPHer), a UKCRC Public Health Research Centre of Excellence. Joint funding (MR/KO232331/1) from the British Heart Foundation, Cancer Research UK, Economic and Social Research Council, Medical Research Council, the Welsh Government and the Wellcome Trust, under the auspices of the UK Clinical Research Collaboration, is gratefully acknowledged. LM and LG acknowledge support from the Medical Research Council and the Chief Scientist Office (MC_UU_12017/13 and MC_UU_12017/14) of the Scottish Government Health Care Directorates (SPHSU13 and SPHSU14). The School Health Research Network is a partnership between DECIPHer at Cardiff University, Welsh Government, Public Health Wales and Cancer Research UK, funded by Health and Care Research Wales via the National Centre for Health and Wellbeing Research. Competing interests LB declares a secondment post with Cancer Research UK and all other authors report no support from any organisation for the submitted work; no financial relationships with any organisations that might have an interest in the submitted work in the previous three years; no other relationships or activities that could appear to have influenced the submitted work. Ethics approval Ethical approval was provided by the School of Social Sciences Research Ethics Committee at Cardiff University (SREC/2188). Data sharing statement Detailed information and access to data for the Smoking Drinking and Drug Use Among Young People in England Survey and the Scottish Adolescent Lifestyle and Substance Use Survey, are available from the UK data archive: http://www.data-archive.ac.uk.